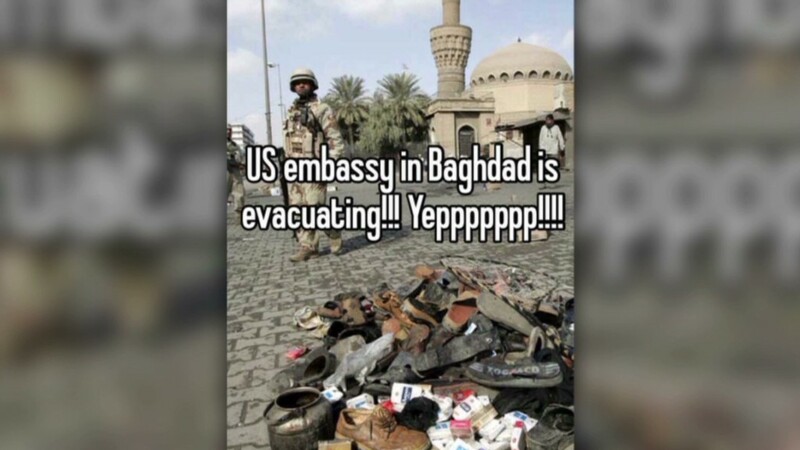 "U.S. Embassy in Baghdad is evacuating..!!!!" That message appeared Saturday at 8 a.m. ET on a secret-sharing application called Whisper. The media reported about the embassy's partial staff relocation hours later. During the intensifying conflict in Iraq, Whisper is becoming an outlet for Iraqis to share information and post their thoughts anonymously in short tidbits. Over the weekend, Facebook (FB) and Twitter (TWTR) said they began investigating reports of service disruptions. Meanwhile, Neetzan Zimmerman, Whisper's editor in chief, told CNNMoney that Whisper usage in Iraq more than doubled between June 12 and June 15. The company declined to provide more specific usage metrics. "All social media were stopped in Iraq my only escape is whisper," one Whsiper user posted. "Waiting our miserable destiny while ISIS progressing towards Baghdad!!!!!" another said. According to Zimmerman, Whisper doesn't collect information that would identify users but it can use geolocation to ascertain a user's location within a 1 mile radius.. Zimmerman says Iraqis are posting everything from frustration with the government to every day issues about relationships and life in Iraq. "On one hand, they're talking about concerns of what can happen," he told CNNMoney. "On the other hand, they're living life and communicating what's normal." In one case, a user posted about his sexual identity. "Gay and single in iraq makes you feel.....empty," the user wrote. "I need..a boyfriend to cuddle with before I get billed [sic] in a bomb ;["
Other users are expressing fear. "We r fine in Baghdad but we r ready for the worse [sic]," one wrote. Applications like Whisper and Secret have recently become popular, though their secretive nature makes it impossible to verify the authenticity of the posts. Yet Zimmerman says he hopes the service will give users a safe platform to share their thoughts. "Ultimately ... you can use Whisper to vent or make statements that you would be concerned to make in an identity-based environment," he said.